Just in time for the gift-buying season, Nelson and Nelson Antiques would like to announce their Holiday Sale, featuring 25% off every item under $10,000 and 30% every item over $10,000. Details on the sale can be found here. Nelson and Nelson wishes you and your family a Happy Thanksgiving. In the spirit of the season, enjoy this intoxicating antique Reed and Barton sterling silver punch bowl, an exceptional estate-condition piece that's perfect for this festive time of the year! This magnificent punch bowl by Reed and Barton of Taunton, Mass. was made circa 1900. The bowl is fully marked with Reed and Barton’s maker’s mark, sterling standard mark, pattern #270A, and a French touchmark indicating that at some point the bowl was imported into France. The bowl is of circular bombe form, raised on a circular pedestal foot, and the rim of the bowl and foot are applied with a cast and chased grapevine border. The grapevine is finely hand chased onto the bowl in a continuous manner emanating from the chased rims. The decoration shows traces of hand hammering highlighting the vine motif. This is a finely executed work of art and would look beautiful holding an impressive floral centerpiece. Researchers have recently reported that most babies born since 2000 in developed countries will live live to be 100 years old! To celebrate this heartening statistic, why not give a gift that will have the staying power of the new baby in your life? This American sterling silver baby cup was made by Tiffany & Co. in 1907. Its cylindrical shape is beautifully executed with an applied and acid-etched design of two cats peering over a brick wall, with one looking anxiously at a little mouse. The design and shape of the mug is very reminiscent of pieces of the Arts and Crafts period. This mug is of heirloom quality and would be treasured by the recipient forever. This is a lovely sterling silver baby spoon by New York silversmiths Brown & Ward circa 1910. This spoon has a curled and tapered handle with deeply etched decoration which includes the word December, a goat labeled Capricornus, and the symbol for this astrological sign, all arranged between branches of holly. This spoon is a charming heirloom that would make an excellent gift for a December-born baby. This antique two-piece child’s set made by Whiting in 1909, is unusual in that it not only depicts two unrelated nursery rhymes, but each piece tells you in chased letters exactly which rhyme it is depicting. The set consists of a bowl and underplate, each with a molded rim. The bowl is of tapered cylindrical form with a chased and engraved scene with the phrase “Hark! Hark! The dogs do bark. The beggars are coming to town.” The dish is chased and engraved with the scene of “Old mother Hubbard, she went to the cupboard.” The scenes are realistically shown in perspective and are beautifully hand chased to bring out the three dimensionality of the design. Each piece features a shield shape reserved for monogramming. Please see our full collection of baby gifts here. Georg Jensen was born in 1866, the seventh child of a knife grinder from Radvaad, Denmark. As a teen he trained to be a goldsmith in Copenhagen, then enrolled in the Royal Academy of Fine Arts to study sculpture. Upon graduating he was disgusted by the Industrial Age and its tactics of mass production so he “decided to devote his art to making beautiful objects of practical use.” (jensilver.com) He reapplied his skills to the metalwork trade, this time as a silversmith under Mogens Baillin. Eventually, in 1904, he opened up his own tiny studio in downtown Copenhagen. With the freedom, at last, to do things his own way, Jensen’s creative aplomb permanently reshaped the language of sterling silver design. His unique products were an almost instant international success. 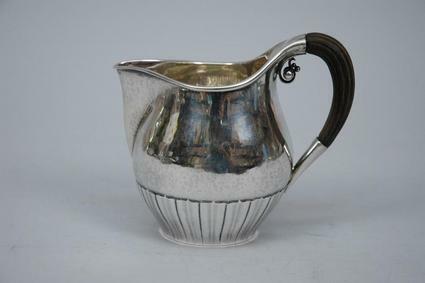 Check out these examples from the online catalogue of Nelson & Nelson Antiques. 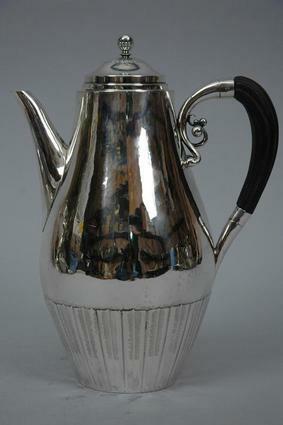 In other circles, it simply became known as The Georg Jensen Style and its effects are apparent. Looking back on early 20th Century trends it's as though Jensen arrived from the future to dictate the course of decorative design. He frequently collaborated with other designers, most notably Johan Rohde, and openly encouraged them to express their ideas and challenge the status quo. Soon the business expanded to include outlets in New York, London, Paris, Stockholm, and Berlin. Although his business suffered throughout the 1920s on account of the economic tensions in war-torn Europe, Georg Jensen’s creations continued to dazzle the art world. He won the Grand Prix at the Paris World's Fair in 1925, then again at the Barcelona World’s Fair in 1929, and then again one final time at the World’s Fair in Brussels shortly before his death in 1935. Today, his spirit lives on in his eponymous company and the artists who continue to use his creative principles.